Background: In this study, we compare the level of two inflammatory markers, high sensitive C-reactive protein (hs-CRP) and procalcitonin (PCT), in pregnant women with mild and severe preeclampsia (PE) and women with normal pregnancy. Materials and Methods: In this case–control study, normal pregnant women and pregnant women with PE were enrolled. Pregnant women with diagnosed PE were selected as case group and classified into two groups with mild and severe PE. Serum samples for measurement of hs-CRP and PCT were obtained and compared in studied groups. Results: In this study, 50 normal pregnant women and 59 pregnant women with PE, 26 (44.1%) mild, and 33 (55.9%) severe were studied. Mean of hs-CRP and PCT was higher in pregnant women with PE than normal pregnant women (7.71 ± 6.19 vs. 5.44 ± 3.94, P = 0.02 for hs-CRP and 0.05 ± 0.03 vs. 0.04 ± 0.01, P = 0.001 for PCT). Area under curve for hs-CRP and PCT was 0.611 and 0.646, respectively. The optimal cut-off point for hs-CRP was 5.24 with a sensitivity of 62.7% and a specificity of 56%. 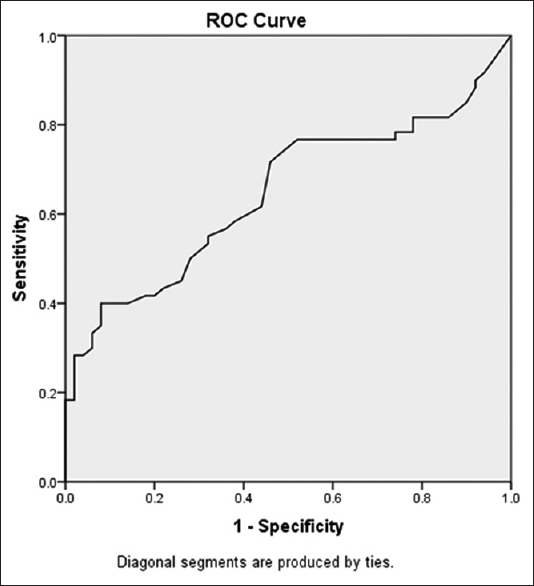 The optimal cut-off point for PCT was 0.042 with a sensitivity of 71% and a specificity of 54%. Conclusion: The findings of this study indicated that higher level of hs-CRP and PCT in pregnant women with PE than those with normal pregnancy could potentially explain the exaggerated inflammation in PE. Regarding significantly increased level of hs-CRP in severe PE than mild PE, we could suggest that hs-CRP is more appropriate marker for investigating pregnant women with severe PE, and its clinical usefulness is superior to PCT in this regard. Preeclampsia (PE) is a human pregnancy-specific hypertensive disorder occurs in about 3–8% of all pregnancies. As the most common medical complication of pregnancy, it is the leading cause of maternal morbidity and mortality. The severe form of PE is associated with higher risk of different adverse maternal and fetal outcomes. Epidemiological studies are indicating that the incidence rate of PE is increasing worldwide, and it is accounting for about 50,000 deaths worldwide annually. The exact pathogenesis of PE is not determined so far. It is suggested that toxic combination of imbalance of angiogenic, hypoxia, impaired immunity, and inflammation is factors associated with the occurrence of PE. There is extensive evidence that activation of inflammation is considered an important contributor in the pathogenesis of PE. It is suggested that during normal pregnancy, the innate immune system is activated, and maternal inflammatory response is stimulated. In PE, the systemic maternal inflammatory response is enhanced, and it is characterized with more generalized intravascular inflammatory reaction. Intravascular leukocytes and the clotting and complement systems are involved in the pathogenesis of PE. It is suggested that early diagnosis of such a serious complication of pregnancy, PE, which have not specific symptoms and diagnostic marker, would be helpful in preventing morbidities and mortalities related to the disease. Considering the role of inflammation in PE, importance of early identification of PE using appropriate inflammatory biomarkers to reduce its related comorbidities and also genetic and ethnic variation on the levels of inflammatory factors such as high sensitive CRP (hs-CRP) and PCT, in this study, we compare the level of two mentioned inflammatory markers in pregnant women with mild and severe PE and women with normal pregnancy. This study conducted as case–control study. During the study, normal pregnant women and pregnant women with PE referred to Obstetrics and Gynecology Clinic of Shariati Hospital Affiliated to Bandar Abbas University of Medical Sciences from May 2013 to May 2014 were enrolled. Protocol of the study was confirmed by Ethics Committee of Bandar Abbas University of Medical Sciences. Normal pregnant women were selected from those who referred to the clinic for regular pregnancy follow-up on the third trimester. Pregnant women with diagnosed PE were selected as case group and classified in two groups with mild and severe PE according to the definition of ACOG. Pregnant women with any sign of infection, premature rupture of membranes, chorioamnionitis, urinary system infection, chronic renal or hepatic disorder, connective tissue disorders, diabetes mellitus, thrombophilia or pregnancies with multiple fetuses or congenital fetal anomaly were excluded. Written informed consent was obtained from each selected participants. Demographic characteristics of studied population were obtained from their medical files. Serum samples for measurement of hs-CRP and PCT were obtained. The level of hs-CRP and PCT were compared in studied groups. Using the definition of Committee of Terminology of ACOG, PE was defined as hypertension (systolic blood pressure ≥140 mmHg and diastolic blood pressure ≥90 mmHg after 20 weeks' gestation) and proteinuria (≥300 mg in a 24 h urine collection or one dipstick measurement ≥1+). Severe PE was diagnosed on the basis of diastolic blood pressure ≥110 mmHg or significant proteinuria (dipstick measurement of ≥2+), or the presence of severity evidences such as headache, visual disturbances, upper abdominal pain, oliguria, convulsion, elevated serum creatinine, thrombocytopenia, marked liver enzyme elevation, and pulmonary edema. Gestational age was evaluated with the last menstrual period and confirmed by the early first trimester ultrasonography scans. 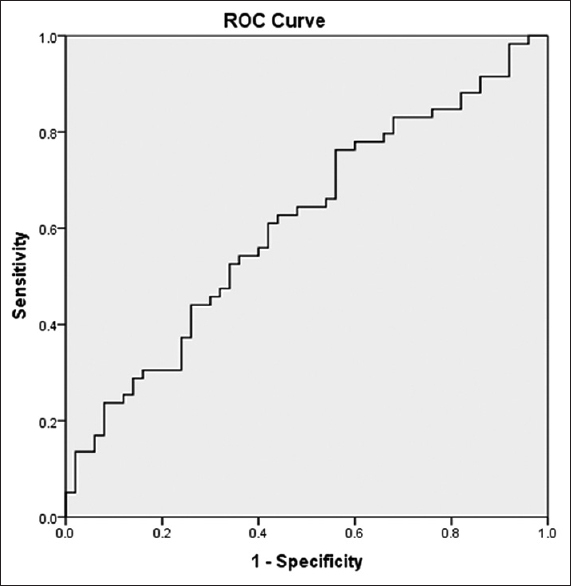 Blood samples (2cc) in women with normal pregnancy was obtained after an overnight fasting. In pregnant women with PE the blood samples were obtained after fasting and before initiation of any medical treatment such as magnesium sulfate or antenatal corticosteroids. The blood samples were centrifuged at +4°C and stored at −70°C until the day of analysis. hs-CRP was measured by turbidimetric method using commercially available kit (Roche, Germany). The serum PCT was determined by using an electrochemiluminescence immunoassay (Roche, Germany). Data were processed by SPSS statistical software program version 20 (SPSS Inc., Chicago, IL, USA). Results were described as mean ± standard deviation (SD). Student's t-test and one-way ANOVA was used to compare the groups. Receiver operating characteristic curves (ROC curves) were performed, and the area under curve (AUC), the optimal threshold score of PCT and its sensitivity and specificity was determined<0.05 was considered as statistically significant. In this study, 50 normal pregnant women and 59 pregnant women with PE were studied. Severe and mild PE was diagnosed in 26 (44.1%) and 33 (55.9%) of studied pregnant women with PE. Characteristics of studied population are presented in [Table 1]. Mean ± SD of hs-CRP and PCT in pregnant women with and without PE and with severe and mild PE are presented in [Table 2] and [Table 3]. ROC analysis and AUC values for determining the sensitivity and specificity of hs-CRP and PCT are presented in [Figure 1] and [Figure 2]. AUC for CRP and PCT was 0.611 and 0.646, respectively. The optimal cut-off point for PCT was 0.042 with a sensitivity of 71% and a specificity of 54%. In this study, we compare the level of hs-CRP and PCT in pregnant women with different severity of PE and those with normal pregnancy. The results indicated that the level of both studied markers was significantly higher in women with PE. In spite of higher level of hs-CRP and PCT in pregnant women with PE than those without, they have low sensitivity and specificity for prediction of PE. Recent studies indicated that PE is not only associated with higher rate of morbidity and mortality but also it is considered as a risk factor of vascular disease both for mother and child. According to these evidence, the rate of stroke is higher among pregnant women with PE, and in their children, vulnerability to depression is higher and cognitive ability is lower than other children, respectively. On the other hand, it seems that preventative strategies for reducing the maternal adverse consequences of PE and its related complication are currently sub optimal may be due to that PE and its severity could not predict clinically. Thus, this study designed to evaluate the role of two inflammatory markers, hs-CRP and PCT, in this field. In this study, the level of hs-CRP was significantly higher in pregnant women with preeclampia than those with normal pregnancy. Considering the severity of the disease, the differences between groups was mainly due to the differences between severe form of the PE and control group and level of CRP in mild and severe form of the disease was different significantly. Montagnana et al. reported a significant higher level of CRP in patients with severe PE, but the level of CRP was not different significantly between severe and mild form of PE. ROC curve analysis indicated that determined optimal cutoff level of hs-CRP has not appropriate sensitivity and specificity for predicting PE. The findings may be due to low sample size of studied population or differences in genetic or ethnic background. Mihu et al. have compared the level of serum CRP in women with PE and normal pregnancy. They showed that serum CRP level was significantly higher in PE than normal pregnancy and could represent as a marker for severity of PE. They recommended to use CRP, a rapid and relatively inexpensive test, in clinical practice among pregnant women with PE to predict the prognosis of PE. Ertas et al. in Turkey have reported the utility of hs-CRP in prediction of PE severity. According to their results high level of hs-CRP (>9.66 mg/L) is associated with higher rate of HELLP syndrome and occurrence of intrauterine growth retardation. They indicated that the optimal cutoff level for hs-CRP was 9.66 mg/L with an 88% and 81% sensitivity and specificity, respectively. In a study in Iran, Farzadnia et al. have determined that hs-CRP was higher in sever PE than mild PE and control group and concluded that it may be useful in predicting the severity of PE. Observed differences between our results and the reported studies may be due to differences in case selection, method of study and sample size. However, our findings confirm the previous reports regarding the inflammatory origin of the disease. Regarding the role of PCT in predicating PE, there were few studies which indicated increased level of PCT in PE and its association with the severity of PE. The relation was first reported by Montagnana et al. and after that by Can et al. They reported higher level of PCT in severe PE. In two recent studies by Kucukgoz Gulec et al. and Artunc-Ulkumen et al. have reported elevated level of PCT both in mild and severe PE., The results of the current study were similar to these studies. The sensitivity and specificity of PCT for predicting PE in determined optimal cut-off level was not appropriate also. As mentioned differences in obtained results may be due to small sample size and other factors related to the design of the study. To the best of our knowledge, there were two similar studies which evaluated the level of both CRP and PCT in pregnant women with PE. Montagnana et al. have measured the level of both CRP and PCT in pregnant women with and without PE. They indicated that the level of CRP was not significantly different in mild PE than severe PE but the level of PCT were significantly higher in severe PE than mild PE, they concluded that PCT is superior to CRP in predicting the severity of PE. In the study of Kucukgoz Gulec et al., significantly higher level of both CRP and PCT in severe PE than mild PE have been reported. They concluded that both of the factors are considered risk factor for PE. In our study level of PCT was higher in pregnant women with PE than those without but it was not different significantly between the mild and severe form of the disease. Our results in this regard were not similar to the two mentioned studies. So we could suggest that PCT could be used for predicting PE but not for its severity. It seems that heterogenous individual properties of studied population in various studies could explain the findings. Moreover, though studied population were similar regarding age and body mass index, other confounding variables such as maternal stress level, dietary properties, and labor characteristics could have role which were not considered in this study. Limitations of this study are cross-sectional design of the study and small sample size of the patients. It seems that for using hs-CRP and PCT as predictors of PE, longitudinal studies from the 1st weeks of pregnancy is more favorable. In this study, the analysis of hs-CRP and PCT was performed in late pregnancy after the clinical manifestations and diagnosis of PE. It seems that more conclusive results would be obtained if the factors measure from the first trimester of pregnancy. In addition, it is recommended to evaluate the performance of combining of both markers for obtaining more conclusive results in this field. The findings of this study indicated that higher level of hs-CRP and PCT in pregnant women with PE than those with normal pregnancy could potentially explain the exaggerated inflammation in PE. Regarding significantly increased level of hs-CRP in severe PE than mild PE, we could suggest that hs-CRP is more appropriate marker for investigation pregnant women with severe PE, and its clinical usefulness is superior to PCT in this regard. However further studies with consideration of mentioned limitations as well as studies more inflammatory factors are recommended. Anderson UD, Olsson MG, Kristensen KH, Škerström B, Hansson SR. Review: Biochemical markers to predict preeclampsia. Placenta 2012;33 Suppl:S42-7. Duley L. The global impact of pre-eclampsia and eclampsia. Semin Perinatol 2009;33:130-7. Kiondo P, Tumwesigye NM, Wandabwa J, Wamuyu-Maina G, Bimenya GS, Okong P. Adverse neonatal outcomes in women with pre-eclampsia in Mulago Hospital, Kampala, Uganda: A cross-sectional study. Pan Afr Med J 2014;17 Suppl 1:7.
WHO. WHO Recommendations for Prevention and Treatment of Preeclampsia and Eclampsia. Geneva, Switzerland: WHO Department of Maternal and Child Health; 2011. Roberts JM, Gammill HS. Preeclampsia: Recent insights. Hypertension 2005;46:1243-9. Redman CW, Sargent IL. Immunology of pre-eclampsia. Am J Reprod Immunol 2010;63:534-43. Mihu D, Costin N, Mihu CM, Blaga LD, Pop RB. C-reactive protein, marker for evaluation of systemic inflammatory response in preeclampsia. Rev Med Chir Soc Med Nat Iasi 2008;112:1019-25. Ertas IE, Kahyaoglu S, Yilmaz B, Ozel M, Sut N, Guven MA, et al. Association of maternal serum high sensitive C-reactive protein level with body mass index and severity of pre-eclampsia at third trimester. J Obstet Gynaecol Res 2010;36:970-7. Khairy A, Fathey H, Abddallah KH, Saber A. C-reactive protein level as an inflammatory marker in patients with preeclampsia. Med J Cairo Univ 2012;80:819-22. 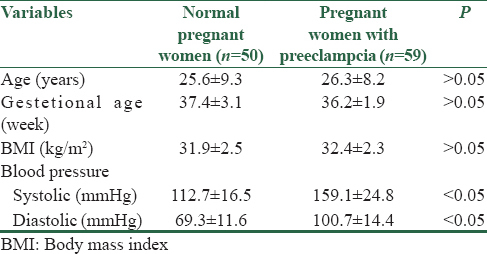 Deveci K, Sogut E, Evliyaoglu O, Duras N. Pregnancy-associated plasma protein-A and C-reactive protein levels in pre-eclamptic and normotensive pregnant women at third trimester. J Obstet Gynaecol Res 2009;35:94-8. Mohaupt MG. C-reactive protein and its role in preeclampsia. Hypertension 2015;65:285-6. Schneider HG, Lam QT. Procalcitonin for the clinical laboratory: A review. Pathology 2007;39:383-90. Kucukgoz Gulec U, Tuncay Ozgunen F, Baris Guzel A, Buyukkurt S, Seydaoglu G, Ferhat Urunsak I, et al. An analysis of C-reactive protein, procalcitonin, and D-dimer in pre-eclamptic patients. Am J Reprod Immunol 2012;68:331-7. Artunc-Ulkumen B, Guvenc Y, Goker A, Gozukara C. Relationship of neutrophil gelatinase-associated lipocalin (NGAL) and procalcitonin levels with the presence and severity of the preeclampsia. J Matern Fetal Neonatal Med 2015;28:1895-900. Can M, Sancar E, Harma M, Guven B, Mungan G, Acikgoz S. Inflammatory markers in preeclamptic patients. Clin Chem Lab Med 2011;49:1469-72. ACOG Committee on Obstetric Practice. ACOG practice bulletin. Diagnosis and management of preeclampsia and eclampsia. Number 33, January 2002. American College of Obstetricians and Gynecologists. Int J Gynaecol Obstet 2002;77:67-75. Hakim J, Senterman MK, Hakim AM. Preeclampsia is a biomarker for vascular disease in both mother and child: The need for a medical alert system. Int J Pediatr 2013;2013:953150. Rebelo F, Schlüssel MM, Vaz JS, Franco-Sena AB, Pinto TJ, Bastos FI, et al. C-reactive protein and later preeclampsia: Systematic review and meta-analysis taking into account the weight status. J Hypertens 2013;31:16-26. Montagnana M, Lippi G, Albiero A, Scevarolli S, Salvagno GL, Franchi M, et al. Procalcitonin values in preeclamptic women are related to severity of disease. Clin Chem Lab Med 2008;46:1050-1. Savvidou MD, Lees CC, Parra M, Hingorani AD, Nicolaides KH. Levels of C-reactive protein in pregnant women who subsequently develop pre-eclampsia. BJOG 2002;109:297-301. Kristensen K, Wide-Swensson D, Lindstrom V, Schmidt C, Grubb A, Strevens H. Serum amyloid a protein and C-reactive protein in normal pregnancy and preeclampsia. Gynecol Obstet Invest 2009;67:275-80. Stefanovic M, Vukomanovic P, Milosavljevic M, Kutlesic R, Popovic J, Tubic-Pavlovic A. Insulin resistance and C-reactive protein in preeclampsia. Bosn J Basic Med Sci 2009;9:235-8. Farzadnia M, Ayatollahi H, Hasan-Zade M, Rahimi HR. A comparative study of serum level of vascular cell adhesion molecule-1 (sVCAM-1), intercellular adhesion molecule-1(ICAM-1) and high sensitive C – Reactive protein (hs-CRP) in normal and Pre-eclamptic pregnancies. Iran J Basic Med Sci 2013;16:689-93.